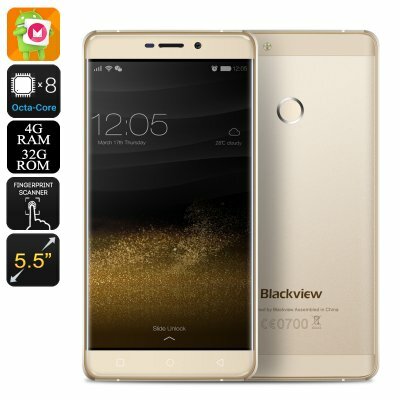 Successfully Added HK Warehouse Blackview R7 Smartphone - Android 6.0, Octa Core Helios P10 chipset, 4GB RAM, Dual SIM, 4G, 5.5 Inch Screen (Gold) to your Shopping Cart. The Blackview R7 comes with the MTK6755P CPU, also known as the Helios P10 chipset it's got great power balanced nicely with high efficiency. When paired with 4GB of RAM as this one is it offer a stunning performance without sacrificing battery life. This is essentially a flasgship phone performance for mid range prices making the R7 a real winner and great value for money. If your into watching movies or playing games then the R7 delivers great entertainment as the Mali T860 GPU can handle even the heaviest of games with 3D graphics. The phones expansive 5.5 inch screen serves up full HD resolutions, so you get about 400DPI for rich quality viewing with great pin sharp details and the 2.5D arc glass makes for a fine finish. Android 6.0 Marshmallow is an attractive selling point as it brings all the best features for mobile software. For better security the Blackview smartphone has a fingerprint scanner so you can keep all you precious information safe. Embracing smart wake and smart gesture technology on this phone lets you easily open and navigate apps so despite its large screen size on handed use is still reasonably easy. When it comes to storage you get 32GB of internal memory and the option to upgrade with via a micros SD card which can deliver 128GB additional storage. With no shortage of space you can really let go with the 13MP rear camera that lets you snap great photos or take HD video. Dual SIM card slots with 4G support make it easy to stay connected no matter where you go and you can enjoy easier organization with two numbers letting you manager work and personal contacts all on the one device. Making the most of its 3000mAh battery the Blackview R7 offers plenty of talk time and can easily go all weekend without a recharge.